Games will be 2 hours 20 mins plus a 1-10 min(s) variable. We will be continuing our "You can bring two armies if you wish" format first introduced in 2014. You can enter using only one list, however if you wish you can also submit two army lists, one Axis and one Allied, and bring both along to the event. If you do bring two armies it means that each and every game you play will be Axis vs Allies (or Allies vs Axis, depending on which side of the table you are sitting...). This will mean that you get to put together/use/show off 2 different armies over the course of the weekend! If one player has two lists, and the other had one list, the player with two lists uses whichever list (Axis or Allied) is opposite to the player with just one list. If you are unable to field two opposing armies, ask on the BF Forum and we're pretty sure someone will lend you and army, otherwise your opponent gets to use the opposite force to yours. If both players have only brought one choice, and they are matched, well, sorry but that's life we're afraid - at least we tried....! The BHGS FoW tournament rules can be found here. 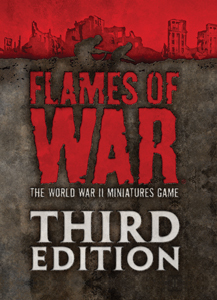 the FoW score for the game multiplied by 3.
their FoW score for the game multiplied by 3.